Free Shipping Included! POP VIEW Intelligence Anti Bark Dog Collar. Stop Dogs Barking Sound & Vibration, Small & Large Dogs, No Shock, No Spray - Dog Bark Collar by POP VIEW at Carrie J Keenan. MPN: bo8m. Hurry! Limited time offer. Offer valid only while supplies last. Is Your Little Buddy Too Loud? Do Your Neighbours Complain About The Non-Stop Barking? Well, The Solution To Your Problem Is Easier Than You Think! Is Your Little Buddy Too Loud? Do Your Neighbours Complain About The Non-Stop Barking? Well, The Solution To Your Problem Is Easier Than You Think! All You Need Is This POP VIEW Bark Control Collar Which Will Turn Training Into An Easy And Fun Task! Sharing your life with a dog is a true blessing! Those beautiful creatures give us so much love and this is why they take up such a special place in our hearts! However, dogs might cause some troubles too. Whether it happens because of boredom or stress, excessive barking can be very disturbing for you and for those living near you too. You have certainly seen those shock collars that scare and punish dogs in an inhumane way. This is definitely not the solution to your problem as you would never hurt your furry friend! This is where we step in! Yay! Good dog!! 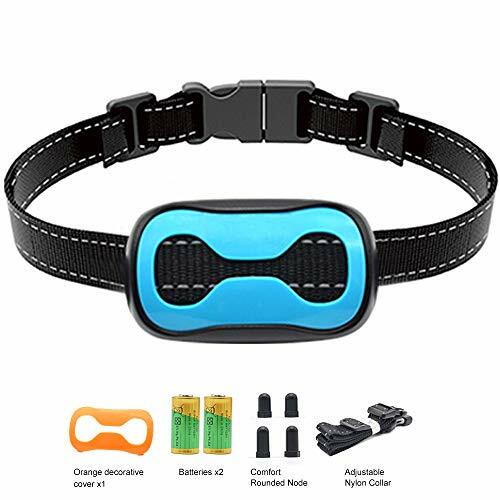 presents you with an amazing, effective, safe training collar which will prevent barking without causing pain or anxiety as it is based on positive reinforcement! This incredible anti-barking device uses nothing more than sounds and vibration to help your dogs correct their bad behaviour. The seven consecutive correction levels that include warning sounds followed by vibrations, make it very easy for dogs to link barking to the corrective response. After that, the collar goes into sleep mode for a minute, so as to prevent your dogs from getting confused. The easily adjustable size of the collar makes it perfect for small, medium and large size dogs alike. Get one for yours too! ✅ Our No bark collar is specially designed to efficiently and safely change barking behaviour in dogs. The combined noise and vibration creates a consistent pattern your dog understands intuitively. Dogs are quick learners - once they realize they can avoid the annoying beep and buzz they stop barking. ✅ 11LBS - 120LBS Dogs : The Anti-Bark Vibration Collar is the perfect trainer collar for dogs weighing from 11LBS to 120LBS. The device can have reduced effectiveness for very large and hairy dogs and old dogs with a long barking habit, so make sure that you are as involved in the training as possible. If you have any questions about this product by POP VIEW, contact us by completing and submitting the form below. If you are looking for a specif part number, please include it with your message.